Calvin Roddie's two goals set Colony Park Juniors on the road to victory against Buchanhaven Hearts. Top of the league Colony Park Juniors continue to set the pace in First Division East following a 3-0 win at Buchanhaven Hearts on Saturday. The Peterhead side are considered to be one of the main challengers for the title, so it was an important win for Colony. They have opened up a four-point gap on Fraserburgh United who defeated Lewis United at home by the same scoreline. The visitors were pressing high and shutting them down early which lead to Hearts losing the ball and being unable to settle or bring any rhythm to their game. Colony took the lead early on when a Calvin Roddie corner looked set for Adam Maitland but the Hearts keeper blatantly pushed the Colony forward in front of the referee. Roddie smashed the ball down the middle with the keeper going right. The Inverurie side went further ahead in 10 minutes. Maitland and Craig Ross had some good interplay down the right flank resulting in a Maitland cutback to Roddie on the edge of the box. He took one touch and despatched the ball into the net at the near post. Both sides pushed for goals and there were chances aplenty for each team but the final goal came for Colony with 10 minutes remaining. Jack Strachan cleverly played a ball over the top of the defence for Maitland to chase and hit on the half volley into the bottom corner to make it 3-0. Table-toppers Colony will face Lewis United at Colony Park on Saturday with a 2pm kick-off. Meanwhile, Colony Park Amateurs fought out a 4-4 draw with Balmedie at home on Saturday. The U19 Colony Locos were unable to emulate the first team when they suffered a heavy 7-1 defeat at Portsoy to an excellent Deveronvale side. The Park side defeated ALC 1-0 with a Lewis Beattie penalty while at the other end keeper Dylan Faskin saved a penalty to ensure the three points. The Colts took on Dee and had eight different scorers. The first goal of the game and his first of the season came from Euan Clark who raced in from the left to meet a cross from Callum Taylor. He twisted round the out-coming defender and slotted it under the advancing keeper. Kyran Ebbrell then had two goals both set up by Murray Liddell. It was then Liddell’s turn to score with an unstoppable shot from a corner. Ebbrell scored his hat-trick on the stroke of half-time with a cool finish into the corner of the net. The second half was just as convincing and started with a goal from Luke Mackie who bossed the midfield from kick-off to the final whistle. His goal came from a throw when he raced into the box and slotted his shot in at the near post. Jamie Reid continued his goal-scoring run in recent weeks by receiving the ball deep in the opponents’ half, jinked past two Dees defenders before finishing into the corner of the net. Ebbrell scored a fourth with a great strike before Ross Allan, from defence, spotted Callum Taylor making an early run who received it wide in his own half, ran down the wing, cut inside and thundered an unstoppable shot into the top corner. Ross Allan then got on the scoresheet with a bullet header from a Euan Clark corner. The final two goals both came from Connor McLeod with assists from Clark to round off a commanding display all round. Both the 15 sides went out of the cup with the Park defeated in Peterhead 7-2 and the Colts losing out to higher league opposition in the form of Westdyke. The 14 Park side progressed with an 8-0 win over Culter Cobras while the 14 Colts had a real “game of two halves “. Although the Colts saw the majority of the first half possession, half time arrived with the game goalless. The second half could not have been more different. An inspired change of formation from the Colts manager saw Aiden Riach pushed into an advanced role which paid dividends almost immediately with two quick-fire goals. 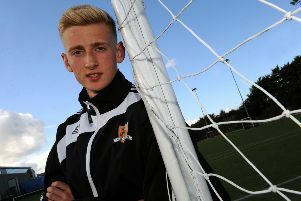 Huntly pulled one back but Riach completed his hat-trick to calm the Colts nerves. Shane McKay added a fourth before Huntly pulled another goal back. The game finished soon after with Colony still on the front foot. The second half proved much more exciting and was a great way for the Colts to advance to the second round of the cup. Colony Colts 13s were knocked out of the cup 11-0 by local rivals Formartine but the Park side eased their way into the next round with a 6-4 victory over Insch and District.